Against this broader backdrop, some have come to worry that many – if not all – the issues connected to science are viewed by the public through a political lens. However, the Pew Research Center finds in a new analysis of public opinion on a broad set of science-related topics that the role of party and ideological differences is not uniform. Americans’ political leanings are a strong factor in their views about issues such as climate change and energy policy, but much less of a factor when it comes to issues such as food safety, space travel and biomedicine. At the same time, there are factors other than political party and ideology that shape the public’s often-complex views on science matters. For instance there are notable issues on which racial and generational differences are pronounced, separate and apart from politics. To better understand the multiple influences on people’s attitudes and beliefs, this report uses statistical modeling to characterize the factors most strongly associated with people’s opinions on these topics. These techniques parse the independent effect of multiple factors at the same time, allowing us to understand with more clarity where traits such as political party, age and race – three important factors in opinion that overlap in meaningful ways in the United States —individually matter. Politics are at the center of people’s views about several of today’s most hot-button scientific issues, especially those surrounding climate, energy policy, and the government’s role in funding science initiatives. Overall, Democrats and liberals are more likely than Republicans and conservatives to say the Earth is warming, human activity is the cause of the change, the problem is serious and there is scientific consensus about the climate changes underway and the threat it poses to the planet. For example, 71% of Democrats and independents who lean to the Democratic Party say the Earth is warming due to human activity, compared with 27% among their Republican counterparts (a difference of 44 percentage points). This report shows that these differences hold even when taking into account the differing characteristics of Democrats and Republicans, such as their different age and racial profiles. Democrats and leaning Democrats also are more likely to favor policies to mitigate greenhouse gas emissions and promote alternative energy sources. Republicans and independents who lean to the GOP are more likely to favor some key energy development policies such as offshore oil drilling, fracking and construction of nuclear power plants. In a December 2014 Pew Research survey, fully 75% of Democrats and leaning Democrats said the United States should prioritize alternative energy sources, such as wind and solar power, over expansion of oil, coal and gas production. By contrast, only 43% of Republicans and leaning Republicans expressed support for prioritizing alternative energy production over traditional energy development. Another set of topics where consistent differences along party and ideological lines occur are views about government funding of the science and engineering enterprise. Fully 83% of Democrats and leaning Democrats say government investment in basic scientific research pays off in the long run, and just 12% say such investments are not worth it. A considerably smaller majority of the GOP and independents who lean to the GOP see benefits from government funding of basic science; 62% say government investments pay off in the long run, but 33% say such investments are not worth it. Political differences on these topics are consistent with party and ideological differences about government spending more broadly, whether related to science or to other domains. While political differences are at the center of people’s views on climate and energy issues, there are a host of other science issues where political factors either share influence with other traits or simply don’t matter. For example, party and ideology are among several factors that influence public views about human evolution. Those other independent predictors of people’s views include their religious affiliation, age, level of education, specific science knowledge and gender. Furthermore, there are no differences between the major party and ideology groups on views about the use of animals in research, the safety of eating genetically modified foods and whether to allow access to experimental drug treatments before those treatments have been shown to be safe and effective. The findings in this analysis are in keeping with past Pew Research and other polls that showed over the past decade that strong political differences among adults affect their views on climate and energy policy topics. This focus on political differences on some science issues may have obscured the also striking influence that other factors apart from politics are tied to public views. The remainder of the summary of findings examines key factors in public attitudes about science topics. Beyond politics, there are persistent gaps on many science topics tied to generational differences. Statistical modeling shows there are substantial differences between younger and older Americans that are independent of people’s political beliefs, education levels or other factors. These include views about climate change, where older adults are less likely to see human activity as a main reason behind global warming, and people’s level of support for stricter emission limits for power plants to address climate change. Apart from their political preferences, older adults also express more support for nuclear power and offshore oil drilling, and they are more likely to prioritize fossil fuel development over alternative energy sources such as wind and solar power. Additionally, people’s beliefs about evolution are influenced by a host of factors, one of which is age. Older adults are, on average, less likely than younger adults to say humans have evolved over time through natural processes, even after controlling for differences in religious affiliation, politics and education. On the topic of childhood vaccines, older adults (especially those ages 50 and older) are more likely than younger adults to see childhood vaccines such as the measles, mumps and rubella (MMR) vaccine as safe and as something that should be required of all children. 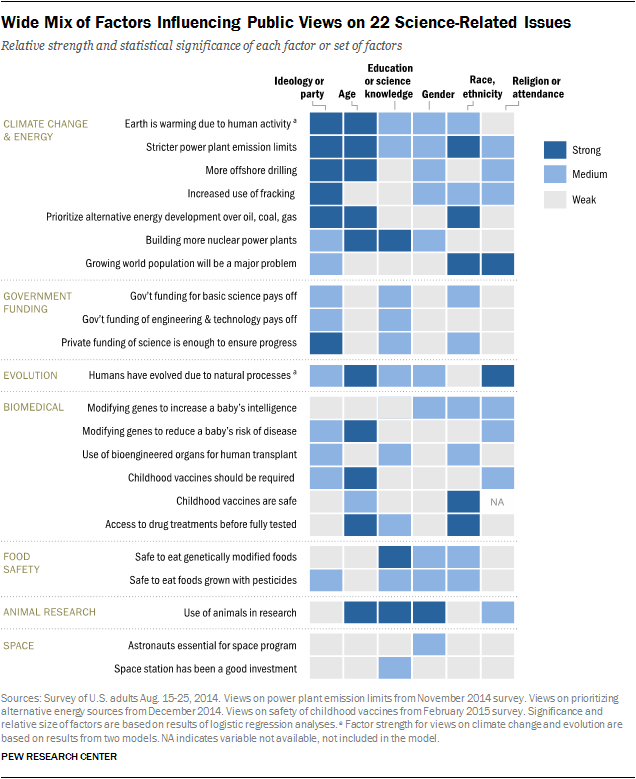 The Pew Research survey included a set of six science knowledge questions in order to evaluate whether people who know more about science, regardless of how much formal schooling they have had, hold different attitudes about science topics. Those with more science knowledge are more likely than those with less knowledge to say eating genetically modified (GM) foods and eating foods grown with pesticides are safe. Those with more science knowledge are especially likely to see bioengineered artificial organs for human transplant as an appropriate use of medical advances. There are only a handful of topics where the impact of either education or science knowledge is classified as a “strong” factor in predicting the public’s views.3 In some cases, such as beliefs about the safety of foods grown with pesticides, there are differences among educational attainment and between knowledge groups. But, the multivariate analysis shows that educational attainment is not statistically significant once other factors are controlled and science knowledge is classified as having a “medium” effect in predicting people’s views. The Pew Research analysis also estimated the differences in people’s views when looking at the combined effect of education and science knowledge. This gives readers another way to gauge the relative impact of education and science knowledge, overall. Some of the largest differences between those with higher education and greater science knowledge, compared with those with less education and science knowledge are views about the safety of eating GM foods and views about the use of animals in scientific research. Also of note is that the role of education and knowledge on people’s attitudes about science-related topics may be complex. Our findings show that people with more science knowledge are more inclined than those with less knowledge to consider scientists as largely in agreement about the topic of evolution, for example. Among those with more science knowledge, 79% say scientists generally agree that humans have evolved over time, compared with 54% among those with less science knowledge. Since people’s beliefs about evolution are influenced by their perceptions of scientific consensus, the total role of science knowledge in shaping a person’s opinion likely operates indirectly through beliefs about scientific consensus as well as directly through beliefs about whether humans have evolved over time. In such cases, the analysis likely understates the total effect of education and knowledge in explaining people’s views. There are a number of science-related topics where men and women hold different views. A majority of men favor the use of animals in scientific research, while a majority of women oppose animal use. And men are more likely than women to see GM foods and foods grown with pesticides as safe to eat. Further, there are notable differences between men and women on energy issues, which are statistically independent from other factors. Controlling for politics and education levels, men, more than women, favor building more nuclear power plants, allowing more offshore drilling and increasing the use of hydraulic fracturing for oil and gas extraction. Men also are more likely to think astronauts are essential for the future of the U.S. space program. There also are differences between men and women on views about a handful of biomedical topics, including views about modifying genetic characteristics to make a baby more intelligent and beliefs about human evolution. At the same time, there are some biomedical issues about which men and women hold similar views (including opinion about childhood vaccines and access to experimental drug treatments) and a few where gender differences are not statistically significant once other factors are accounted for (such as views about bioengineered artificial organs). Despite a gap between men and women in their views on a range of science topics, and their interest in science, technology, engineering and mathematics (STEM) fields, men and women are about equally likely to express support for government funding of basic science, engineering and technology, and to consider our investment in the space station good for the country. African Americans are particularly distinct in their views about allowing access to experimental drug treatments before they have been shown to be safe and effective. A majority of African Americans oppose this idea while a majority of whites and about half of Hispanics favor it. African Americans also are more likely than either whites or Hispanics to say we will find ways to stretch our natural resources such that the growing world population will not pose a major problem. Another oft-discussed factor in people’s beliefs about science topics concerns the role of religion. There has been debate among religious leaders over the theory of evolution through natural selection since the initial publication of Charles Darwin’s “On the Origin of the Species” in 1859.7 Stemming from what some see as a contradiction between the theory of evolution and core tenets of the Christian faith, the debate over evolution and its place in the school curriculum has played out in local communities and the courts around the country, including the Supreme Court in State of Tennessee v. Scopes, popularly referred to as the Scopes “monkey” trial of 1925. The analysis in this report shows that religious differences in affiliation and worship service attendance come to the fore for some science topics, particularly beliefs about human evolution and perceptions of scientific consensus related to evolution or the creation of the universe. At the same time, people’s religious differences do not play a central role in their beliefs about a range of other science topics including some in the realm of biomedical issues. We will have more to say about the intersection of religious beliefs and science in a follow-up report to come.